By the end of the weekend spent on and around Mount Shasta, the forecasts were calling for the high pressure to break down within the next few days and a huge offshore low would begin to dominate the weather pattern, driving freezing levels below 5000 ft throughout the entire Cascade Range. My Southern Cascades ski odyssey would thus be coming to a premature end within a couple of days. It looked like Monday would still be OK weatherwise in southern Oregon, so on Sunday evening I headed north from Shasta to the lovely town of Ashland, southwestern gateway to Mount McLoughlin, and turned in for the night. The freezing level was forecast to reach only 8000 ft on Monday, so another late start was in order to give the snow plenty of time to soften. I planned to climb and ski the SW Face of Mount McLoughlin, a spectacular 35-40 degree slope marked by two prominent gullies which extend from the 9495 ft summit down to below 7000 ft. This is the shortest and most direct route on McLoughlin, with access beginning from the Rye Springs Road 3740. However, in winter only the first hundred feet of the road north of Hwy 140 is plowed, to form the tiny South Rye Sno-Park at 4700 ft. The road was still blocked by snow there, but mostly melted out beyond, so skis would need to be carried now, perhaps for 1-2 miles. A cold gusty SW wind was also blowing, so it was not clear whether the SW Face would soften well on this day, especially up high. On the other hand, the access to the SE side from the Summit Sno-Park (5050 ft) at Road 3650 still had 1-2 ft of continuous skiable snow on the road. The Pacific Crest trailhead is immediately adjacent, but the first part of the PCT was melted bare, so skiing up Road 3650 to the standard McLoughlin summer trailhead seemed like the best option, although a lengthy one. I skinned up the road at 10am, covering the 2.5 miles NE to the summer trailhead in under an hour and then trying to follow the trail heading NW from there. This was impossible due to 4-5 ft of snowpack, and several random sets of ski/snowshoe tracks in the woods did not help, so it was best to just ski NW by dead reckoning until the east ridge of McLoughlin was gained at 6200 ft above Freye Lake. I followed the ridge west, staying just below (south) of the crest and eventually reached timberline near 8000 ft. I continued skinning up the series of bowls on the SE side of the mountain, eventually reaching 9050 ft on the uppermost SE Face. The wind was very gusty now, and a huge plume of snow was being blown off the summit by the strong SW winds, with occasional clouds obscuring the summit entirely. I took a lengthy break to evaluate the situation and switch to crampons to climb the final 450 ft on foot. But eventually, it seemed pointless to proceed further into the teeth of the incoming weather, so it was time to ski down at 3pm. The SE Face was in great shape at this hour, softened to really excellent corn from 9050 ft down to about 8000 ft. Below that, the snow grew increasingly mushy and unconsolidated, as I followed the SE Face all the way down to the end of the clearing at 6300 ft. Upon reaching the forest, it was time to start skiing and traversing SE to try to rejoin Road 3650 (skiing straight down the fall line from here would bring you out to Hwy 140 at 4800 ft about 1.5 miles west of the trailhead, and would probably now be melted out and unskiable for the last several hundred vertical feet). I eventually traversed east and SE near the 5600-5400 ft contours for about an hour, crossing several snow-covered lava flows which are shown only as clearings on the topo map. Eventually the plan worked and I reached Road 3650 near 5200 ft, on continuously skiable snow the whole way. A quick half-mile schuss down the road brought me back to the car by 5 pm. All in all, it was a pretty good day with 4000 vft of skiing, despite being denied the summit and spending a lot of time traversing around in the woods. This photo looks up the SE Face of Mount McLoughlin from the end of the clearing at 6300 ft. A plume of windblown snow is seen extending right from the summit. My ski route begin just below the end of the plume and followed the right (east or skier's left) side of the clearing most of the way down. Click here for a double-size version of this photo. Wow! Kudos on the great trips, Amar! It's unfortunate about the weather. One question: You allude to getting weather forecasts while you are traveling. If you don't mind me asking, what is your source for accurate forecasts while you are on the road? Thanks for theTR. Jill and I skied at Bachelor on the 7th and I passed the TH for McLoughlin that afternoon. I was tempted to tour there on the 8th but decided to try after our trip in the Eastern Sierras. 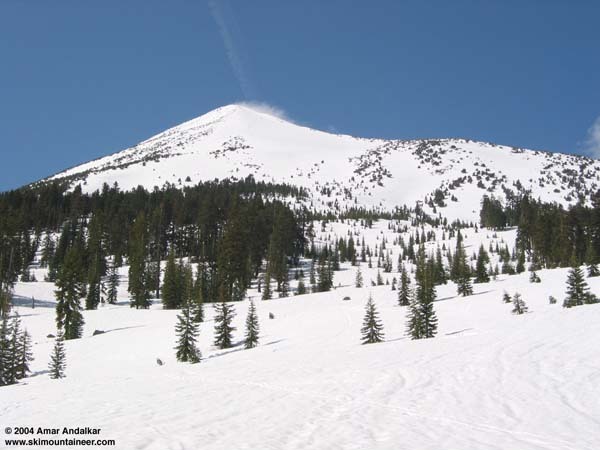 Also plan to return to Lassen and ski the NW side this time. Jill has never skied Shasta so if the weather looks good we'll probably stop by there. The touring in the Tahoe and Eastern Sierras has been great. In 2005, you need to go a bit further south. Well, the internet is the only place to find reasonably accurate forecasts. On previous long Cascades trips, I used to hunt around for internet cafes and public libraries with internet access in various nearby towns. But since I bring my ancient (circa 2000) laptop along on the lengthy trips anyway, I have now bought a WiFi card for it, and I try to find free WiFi cafes. Wi-Fi FreeSpot has state-by-state lists, although I've found several other good free spots which they don't list. The websites Wi-FiHotSpotList.com and JiWire.com are also useful. I simply print out lists of these spots (and also maps to find the particularly useful looking spots) and bring those along in the car. Does anybody know of other good websites which list free WiFi locations in the western US and Canada? I have a NOAA weather radio I got cheap at a garage sale. Sometimes it works, sometimes it doesn't, but most often I can pick up forecasts near cities. It's highly likely that mine is somehow broken and a new one might work better. It gives the same forecast on the National Weather Service web site, except vocalized through an automated computer voice. We are presently at Schat's Bakery in Bishop using our Sierra Wireless card in our laptop and a T-Mobile link to cruise the internet. A day off from skiing due to a storm in the Sierras. Love this wireless technology. Big high pressure system building on Tuesday. The Eastern Sierras are at their peak. I have a NOAA weather radio I got cheap at a garage sale. . . It gives the same forecast on the National Weather Service web site, except vocalized through an automated computer voice. I have the automated phone info numbers of several local NWS offices throughout the Cascades programmed into my cell phone, these also give the same short-term forecasts as the NWS web site (and most people have cell phones but not weather radios). However, the huge advantage of the internet is that you can look at the medium-long range (3-10 day) forecasts and discussions from several models, which is essential for trip planning more than 1-2 days into the future. The regular NWS forecasts are of limited reliability and utility beyond a couple of days, unless there is stable high pressure in place. My wife Andrea and I skied this in June 1999. We use the "Oregon Descents" book for info. We also found it very hard to follow the summer trail altho we spent a good deal of time trying. We had reasonable weather altho visibilty would come and go as clouds moved through. The descent was fabulous with many vertical feet of lovely corn snow. I was thinking that doing this route via Hiway 140 might be a better way to do this trip so that you don't spend so much time traversing. On our return traverse we ran into a very well flagged trail that also didn't follow the summer trail but did eventually take us back to the trailhead. Overall great trip and great destination. Ditto on the weather info. We used a NOAA weather radio which worked pretty well and internet cafes when in towns. Enjoy your Tour de Volcanoes!